Today we're revealing the Homestead Project and there's so much to discuss: brass, mixing black and blue, repetitive shapes (how many circles can you count?) and defining "transitional" style. Where do we start? How about here. For this project we sourced items from many, many different stores: Arhaus, Boston Interiors, Wayfair, Crate + Barrel, Target, Ballard Designs, Pottery Barn, HomeGoods...everywhere! Which is a great lesson that you don't need to buy all your furniture and decor from one store to create a cohesive feel. The general vibe is a modern take on classic stylings...aka transitional. Transitional has come to be the default description for interior styles that you can't otherwise define and we think that's because transitional speaks to most homeowners style goals these days - a beautiful (classic) with a heavy emphasis on comfort and function (modern). Enough with the design lesson. Let's take a peek at what the space looked like before we got started. One of the initial challenges we faced was the layout. The room is really long. It's fantastic to have a huge room, but it can be overwhelming to configure a layout that takes advantage of all the space without excessively chopping it up or awkwardly floating furniture. The ideal is to create sections of function that all connect. We're planning to copyright the term "sections of function" because it just rolls of the tongue...or not. But you get the idea - the goal is to define separate sections without completely disconnecting any one section from the others. The first section we created (below) is what you see when walking into the living room from the kitchen. It's almost, sorta, kinda a hallway within the room. It defines the room entrance and gives breathing room to the largest pieces of furniture. The weathered black cabinet at the end of the "hallway" provides fully hidden storage and a mirror reflects natural light from all the windows. The decor on/around the cabinet is important for a couple reasons. First, it connects this little section to the rest of the room. Second, decor can play defense to all those piles of junk that many of us instinctively want to make. If the cabinet top is covered with a pitcher, plant and decorative box, there's less room for old magazines and dirty gym socks. Who else has a family member that leaves dirty gym socks literally everywhere??? From this section, we turn to the meat of the room - the main seating area and the TV unit. Our client already owned the TV unit and it fits perfectly in a carved out nook within the room. Rather than start over with a brand new piece of furniture or custom built-in, and spend quite a bit of moolah in the process, we made a few simple, high-impact changes. To begin: baskets. Four proportional baskets. In order for baskets to be the home run they are meant to be, you have to choose the right size basket for the space. Something too small will minimize the function and something too big will look squished and awkward. It's a classic Goldilocks situation - it's got to be just right. We also styled with decor while leaving some negative space and hand-painted the knobs a matte brass (they were a matte silver). Brass was our go-to color and finish throughout this project. It's sophisticated, current and plays very well with black. It's also warm and inviting - just what you want your living room to feel like. We used brass in decor, light fixtures, lamps and one piece of furniture (a hammered drum table I'll get to in a bit). But, we were careful not to over do it. Too much of a good thing can be not a good thing. Even when it comes to s'mores. Opposite the TV unit is, of course, the main seating area. Our client has a big family and regularly hosts holidays and Sundays. This meant we needed to provide at least as much seating as the existing sectional and armchair provided...ideally more. The new sofa and loveseat accomplish the "at least as much as" and the matching blue ottomans accomplish the "ideally more". The ottomans are additional seating and equally perfect for kicking up feet. And, they're round. 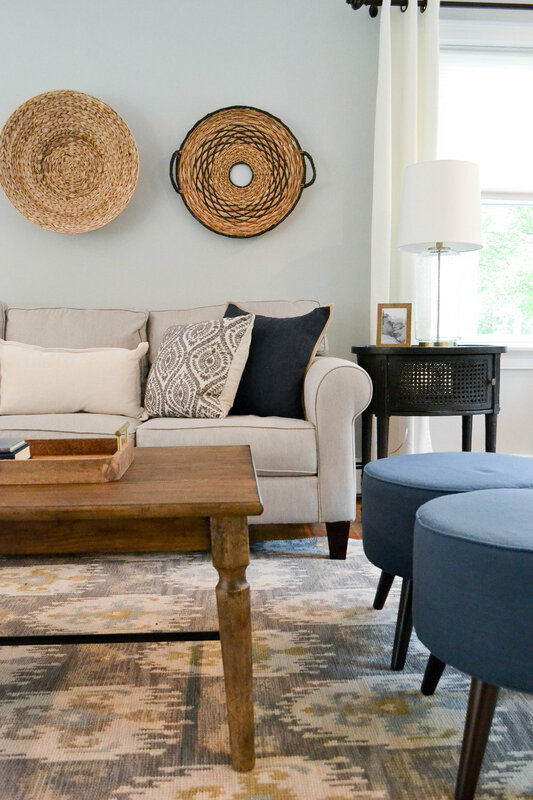 If you hadn't noticed, now feels like an appropriate time to point out all the circles in this room: the mirror, the light fixture, the side tables, the baskets behind the couch and the ottomans. Repeated shapes - whether they be circles or hexagons or triangles...or whatever - give a subtle feel of cohesiveness. Perhaps most importantly, the low profile of the ottomans connect this main seating area to the far end of the room, which was previously cut off by the sectional and feeling useless to the homeowners. The far end of the room previously had a pack n play and not much else. One of the biggest changes we made in this area of the room is the addition of a built-in window bench. The goal of any built-in, window benches included, is for them to appear as if they were meant to be in the space. This window bench provides even more seating in the room for those family Sundays and the top lifts to reveal a bunch of storage (for all the toys the pack n play user will accumulate). The reading nook is also new to the space. 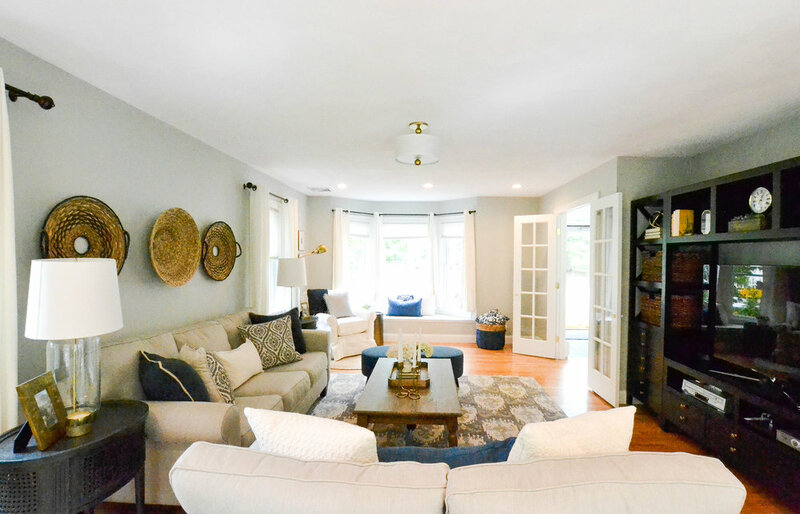 We had so much fun designing this room and we hope the homeowners have so much fun living in it. Can't you picture a serious game of Apples to Apples or Cards Against Humanity (depending on how you roll) going down on the coffee table? For even more photographs of the space, head to our Portfolio. And below is a source list. This post contains affiliate links. This means that, at no cost to you, if you click a link and make a purchase we may make a commission. Blue and natural basket - The one we grabbed from Target is no longer available. Here is a similar sized floor basket also from Target.